Easy-to-grow tropical flowering shrubs, durantas (Duranta spp.) are remarkably trouble-free and you'll have few chores other than watering them in dry weather. 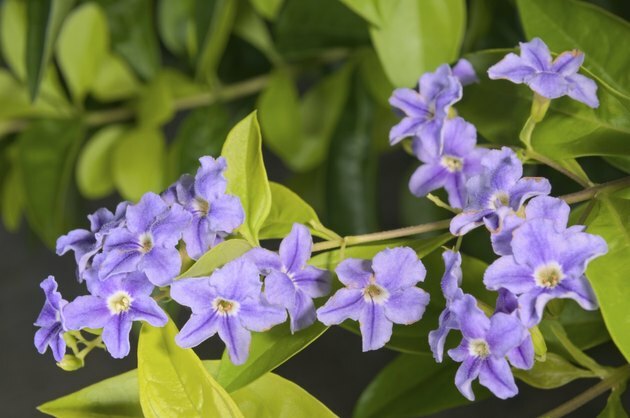 The species you're most likely to find at the garden center is golden dewdrop (Duranta erecta), a sprawling, tender evergreen shrub or small tree. You can grow golden dewdrop in U.S. Department of Agriculture plant hardiness zones 8 through 11, although it will die back in winter in USDA zone 8. In USDA zone 8, it will recover in spring to flower although it won't set berries in fall. Durantas can tolerate sandy, loamy and clay soils with a pH between 6 and 7.5 and they are moderately tolerant of salt. Durantas don't generally have problems with pests or diseases. If you have tight, compacted clay soil, loosen it up by mixing in 3 to 4 inches of compost. To ensure the soil drains properly in rainy areas, plant durantas in a raised bed. Water newly planted durantas daily at first, tapering off to once a week. Mature durantas have deeper roots, and you do not have to water them unless the top few inches of soil are dry. Sprinkle a handful -- 1 ounce -- of granular, slow-release 6-6-6 fertilizer under the outer edge of the branches at the beginning of June, in mid-August and mid-October. Do not allow clumps of fertilizer to stay on the ground or scatter the fertilizer near the trunk because it can burn the roots. Water the area well after applying the fertilizer. If you have space you want to fill quickly, durantas are a good choice. They grow rapidly, more than 25 inches a year. Golden dewdrop has multiple stems that can grow from 8 to 15 feet tall with a round crown. Its drooping, vinelike branches can trail 10 to 15 feet wide. You may have to thin and prune a golden dewdrop regularly to prevent it from sprawling beyond the space you have in mind. If you grow durantas as mounded bushes, give them at least 6 feet of room unless you want to constantly cut them back. Always sterilize pruning equipment before and after using it by wiping it with a cloth soaked in rubbing alcohol. Avoid planting durantas along building foundations because you have to prune them away from walls. While the young branches are smooth, mature branches develop sharp spines. Durantas can grow and spread from suckers, but they're not classified as invasive. Durantas may be poisonous to animals, but they're not considered poisonous to people.